Electro-Harmonix Muff series of pedals are among the most iconic effects ever made. However, Big Muff Pi is not the only flavor out there. 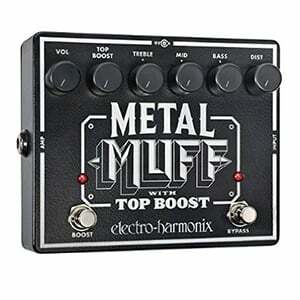 If you like a heavier tone, Electro-Harmonix Metal Muff is there to help. It is easily one of the most capable distortion pedals for metal music. One thing that all Muff series pedals share is a simple design. For the most part, Electro-Harmonix stuck with their classic double wide chassis, although this time around it comes with an all black finish. In all honesty, there is something ominous about Electro-Harmonix Metal Muff, as there should be. This pedal is nothing like the fuzz overdrive we are used to. It is a whole different beast. In terms of build quality, you can expect to get that same ruggedness and durability we are used to seeing from Electro-Harmonix. There’s no amount of abuse that can put a serious dent in this bad boy.Metal Muff comes with a true bypass and can be powered using either a 9V battery or a standard DC adapter. Only thing we would like to note is that mounting it on a pedal board might prove to be a nuisance due to its size. The moment you see the controls on this pedal, you will gain a relatively accurate idea of what it is capable of doing. All of the knobs are located at the top of the pedal and there are many of them. You are looking at your standard Volume and Gain knob, with the latter labeled as Dist instead. Then we have a three band EQ that’s rather responsive and precise. Lastly, there is the Top Boost knob with the corresponding foot switch at the bottom of the pedal. In essence, you are getting two levels of gain in this package, one default and one that you can turn on when necessary. To most, that might seem like an overkill and it might be true if the brand behind the pedal wasn’t Electro-Harmonix. They have put this thing together almost flawlessly. 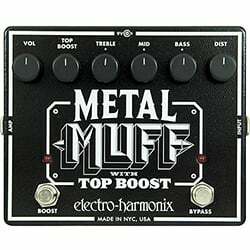 To put it simply,.Electro-Harmonix Metal Muff is the ultimate source of gain. It is literally all you could ask from a distortion pedal and then some. To start things off, Metal Muff gives you almost a Plexi like tone when you use the default mode. There is plenty of gain, but it is well structured. As you drive the Dist knob clockwise, the pedal responds with a smooth gain curve that adds a quite a bit of meat into the signal. The EQ section can only be described as awesome. Not only does it do a great job at managing the gain, but it allows for quite a bit of versatility. Top Boost is where things go crazy. Right up to 10 o’clock position, this mode adds a whopping amount of girth. Once you go past that point, things get pretty hectic. Overall, this thing rocks. Electro-Harmonix Metal Muff has proven to be a very powerful tool that can easily overwhelm you if you go too far. With that said, it offers a lot of freedom to the user and delivers one of the most genuine distortion effects we have heard so far. It’s a beast. 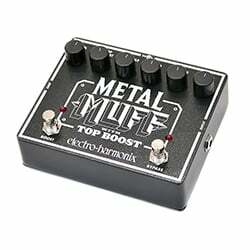 For more info about the Electro-Harmonix Metal Muff, click here.